Memory cards have been around for more than twenty years. As you might expect, during that time they have gone through some major changes. So, in this infographic we are going to discuss about types of SD card, understanding SD, SDXC, SDHC cards, card memory capacity, speed, bus speed and more importantly which SD memory card is right for your devices such as digital camera/camcorder, mobile devices, tablets, etc. Today Secure Digital (SD) Memory Cards is used in many digital cameras, mobile phones, tablets, laptops, portable media players and even video game for removable data storage. Most people are buying a memory card based solely on storage capacity, but there is more to choosing a card than just the amount of data it can hold. Photographer will most likely need a CompactFlash card for DSLRs, although it is also common to see DSLRs to that uses SD, CF card and XQD cards. For smaller Point & Shoots camera, an SD or microSD card will work. Videographer will do well with large capacity SD or microSD card, depending on the equipment. For improved performance, particularly for 4K, you should look for a card that supports U3 speed class and UHS-II bus. Most Smartphone use microSD cards because of their tiny form factor. So, buy a card that is suitable for your needs. Transfer rate and speed won’t be as important to you unless you are using your smartphone to record 4K video. Any card at any speed will serve you well. Since you are using to store item like movies, music and books. Make sure your device uses SDHC or SDXC cards. If you recording video in 4K on your tablet, then make sure your card sustain the bitrates required for 4K. 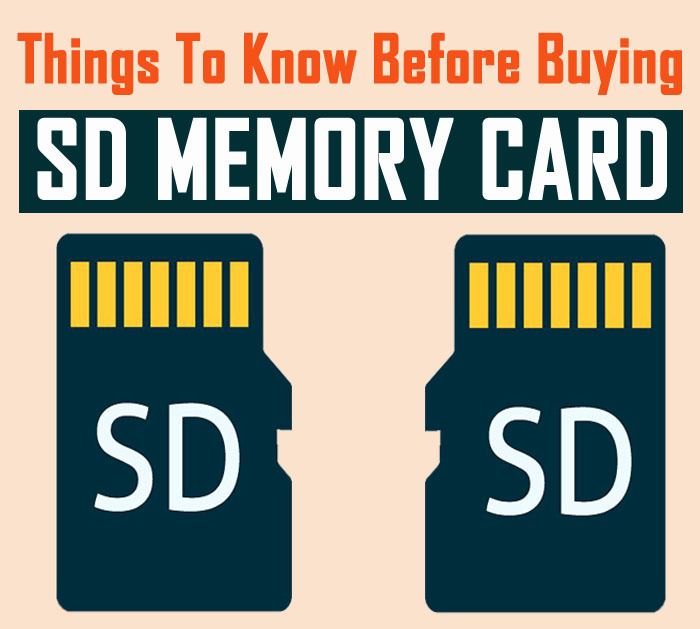 So, without making any more delay, here go through the infographic that explains in details that what things and facts you must know before buying SD memory card. Go through the infographic that explains in details that what things and facts you must know before buying SD memory card for your camera/camcorder, Smartphones and tablets.